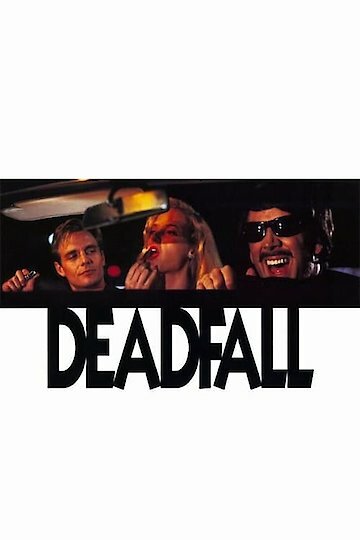 Deadfall is a 1993 comedy crime drama film, directed by Christopher Coppola. The film begins with a con game that goes bad. Joe Donan, played by Michael Biehn, kills his father Mike, played by James Coburn unintentionally. Before his father dies, he tells Joe to go see Lou, also played by James Coburn, Joe’s Uncle and retrieve something he stole from him years ago. Joe travels to Santa Monica to see his Uncle Lou who introduces him to a guy named Eddie, played by Nicholas Cage. Lou suggests Joe and Eddie go out together for some fun. Eddie decides to bring his girlfriend along Diane, played by Sarah Trigger. Diane sends Joe some suggestive glances when Eddie isn’t looking. Eddie puts Joe to a test by telling him he needs to go into a bar and meet with a guy who has owed money to Lou for 3 months. Eddie has been told to retrieve it in the past, but never had any luck getting it. Joe goes in and comes out laughing with the man and gives him a hug when he leaves. Eddie is thrown by the whole thing and asks him if he got the money. Joe smiled and took it out of his pocket. After the night out Diane ends up seducing Joe. Eddie soon finds out about it and goes after Lou saying everything was his fault. Diane tells Joe about it and Joe goes to help out Lou. Joe gets there just in time and Lou is very grateful. They get closer and Lou fills him in on a con he wants to pull. Joe meets with a pool shark Morgan, played by Charlie Sheen, ends up losing but meets the man Lou wants to pull the con on. The man agrees to give two million dollars for some diamonds and they schedule where to meet. Joe is once again surprised when the con goes down. Deadfall is currently available to watch and stream, buy on demand at Amazon, Vudu, Google Play, FandangoNow, iTunes, YouTube VOD online.